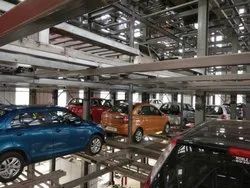 Prominent & Leading Manufacturer from Chennai, we offer computerized car parking system production, mechci cad car parking lift in e star engineering, car parking elevator, mechci cad car parking elevator, car parking lift services and multi floor type car parking system in e star engineering. Drive Type Rope / Chain to levitate the Car. 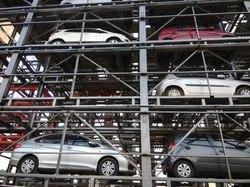 We are the leading supplier and exporter of Puzzle Car Parking in India. So now more cars can be parked in a small and limited space. 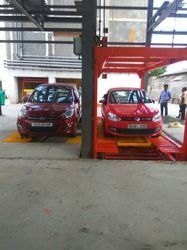 This automated car Parking system or automatic car parking system is especially meant for residential and commercial area and there is vehicles can drive in and out without moving other cars. Thus, no operator is required and the car parking system is available in 2 rows, 2 verticals and upto 2 rows or 2 verticals depending upon the space available. We mainly offer our products and services in Tamilnadu, Chennai, Mumbai, Hyderabad, Pune, Bengaluru, New Delhi and all over India.Advantages Independent parking No need of operatorThe system is available in 2 to 6 levels both above and below the ground or in combination as well Saves money.Grid structure is flexible.The system has built in operational and functional safety features User friendly and cars can be retrived using Push button / coded keys or Smart cards. 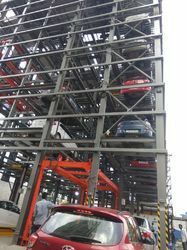 About:Lateral and vertical moving platforms used to park multiple cars in a puzzle like structure. This is designed with multi levels and multi rows with exchanging space. All spaces can be auto- lifting freely except ground space. This system has High-speed lifting mode to reduce the parking of vehicle with forwarding style, vertically horizontally is possible. This system is electromechanically operated and it’s like Fast IN Fast OUT of the cars. It is possible for indoor and outdoor installation. This system is easy serviceable and maintainable. It is Suitable for Indoor Outdoor installations.We mainly offer our products and services in Tamilnadu, Chennai, Mumbai, Hyderabad, Pune, Bengaluru, New Delhi and all over India. 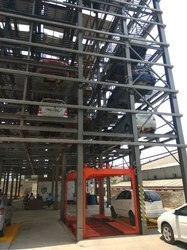 About Stacked Car Parking System: Stacked Car Parking System is similar to the two post car parking system (Hydraulic type car parking system). 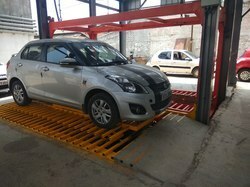 Instead of Hydraulic System we use Rope / Chain to levitate the Car.We have our advanced design and prototype patent in USA , Japan , India , Singapore to make the Stacked Car Parking System Independent and Dependent Type.E STAR also provides One year free maintenance for the system The installation time will be less than 30 days that includes testing and commissioning.Relocation is Possible in Stacked Car parking System.Suits both Indoor and Outdoor Installation.Stacked Type is the economical and simple parking solution for new Buildings or existing Societies.We mainly offer our products and services in Tamilnadu, Chennai, Mumbai, Hyderabad, Pune, Bengaluru, New Delhi and all over India. Features:High performance Durability Less power consumption. This Unique Automated Mechanical Parking System is designed to permit 7, 8, 10 or 12 cars ( 8 or 10 SUV's) to be easily and safely parked on the surface area required to park just 2 cars.The Rotary type Car Parking System is designed to permit up to a maximum of 12 cars or 10 SUV's to be parked easily and safely.A system that two sprockets as a set are fixed; one onto a upper part of a structure and the other onto a lower part and then a cage hung to a attachment of a special chain circulates with vehicles loaded.Future Expansion is not possible.E STAR also provides One year free maintenance for the systemSuits for Outdoor Installation for places like Apartments , Malls , Public Places etc.We mainly offer our products and services in Tamilnadu, Chennai, Mumbai, Hyderabad, Pune, Bengaluru, New Delhi and all over India. 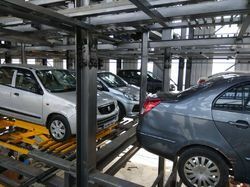 Shuttle Type Car Parking System is a lift type arrangement to move the Car both horizontally and vertically and place the Car in the allocated Pallet.We have our advanced design and prototype patent in USA , Japan , India , Singapore to make the Stacked Car Parking System Independent and Dependent Type.E STAR also provides One year free maintenance for the system The installation time will be less than 2 to 3 Months that includes testing and commissioning based on the number of Cars and Levels.Relocation is Possible in Shuttle Car parking System.Suits for Outdoor Installation for places like Apartments , Malls , Public Places etc.Shuttle Type is the economical and simple parking solution for bulk number of cars are to be parked.We mainly offer our products and services in Tamilnadu, Chennai, Mumbai, Hyderabad, Pune, Bengaluru, New Delhi and all over India. 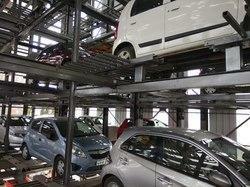 The Dual-Floor car parking system offer greatest possible flexibility for the realization of optimum parking solution. A fast parking process in which the driver does not have to maneuver his car or drive backwards, guarantees highest comfort and security. A single lift serves 6 to 12 parking spaces per level taking up a minimum of space. 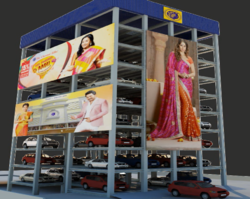 Time-saving vertical and horizontal movements take place simultaneously ensuring fast parking and retrieval times.In multi floor car parking we have specified the space for types of car like hutch back , sedan SUV on every floor this will minimize the space because each type of car standing on same row not in messy wayWe mainly offer our products and services in Tamilnadu, Chennai, Mumbai, Hyderabad, Pune, Bengaluru, New Delhi and all over India. 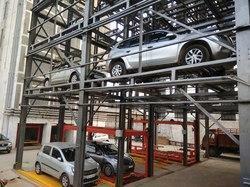 The Dual-Floor car parking system offer greatest possible flexibility for the realization of optimum parking solution. A fast parking process in which the driver does not have to maneuver his car or drive backwards, guarantees highest comfort and security. A single lift serves 6 to 12 parking spaces per level taking up a minimum of space. 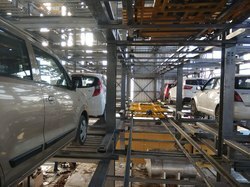 Time-saving vertical and horizontal movements take place simultaneously ensuring fast parking and retrieval times.In multi floor car parking we have specified the space for types of car like hutch back , sedan SUV on every floor this will minimize the space because each type of car standing on same row not in messy way We mainly offer our products and services in Tamilnadu, Chennai, Mumbai, Hyderabad, Pune, Bengaluru, New Delhi and all over India. 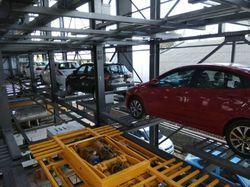 About Stacked Type Car Parking System: Stacked Car Parking System is similar to the two post car parking system (Hydraulic type car parking system). Instead of Hydraulic System, we use Rope / Chain to levitate the Car. 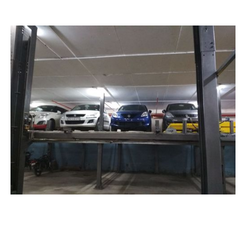 We have our advanced design and prototype patent in USA, Japan, India, Singapore to make the Stacked Car Parking System Independent and Dependent Type. E STAR also provides One-year free maintenance for the system The installation time will be less than 30 days that includes testing and commissioning. 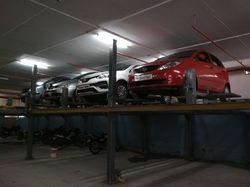 Relocation is Possible in Stacked Car Parking System. Suits both Indoor and Outdoor Installation. 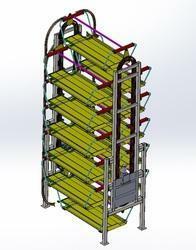 Stacked Type is the economical and simple parking solution for new Buildings or existing Societies. We mainly offer our products and services in Tamilnadu, Chennai, Mumbai, Hyderabad, Pune, Bengaluru, New Delhi and all over India. Looking for Car Parking ?